What stories come to your mind when you hear George Washington mentioned? You might think of those famous words, "Father, I cannot tell a lie." 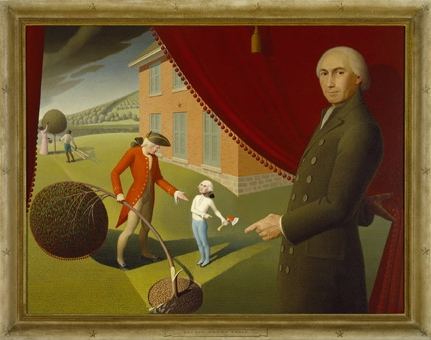 The story of young George chopping down a cherry tree came from a man who lived near Washington and had known him. Mason Locke Weems, sometimes known as Parson Weems, wrote a biography of the first president shortly after his death. In it he included an account of young George confessing to his dad that he had axed the favorite tree. Link here for Parson Weems' story. When historians have looked for proof that young George was really guilty of this crime, however, they come up short. We don't have any other primary sources, like letters or a diary from the time period, that confirm this story. Why then might people appreciate this story about George Washington even though they know it isn't really true? Along with the cherry tree myth, you might have heard another rumor about the Revolutionary War commander and first president. Have you ever heard that Washington's teeth were wooden? Fortunately, in this case, we do have Washington's letters to help us get to the bottom of things.